Welcome back - we're going to be drafting the back sloper now. If you've just joined us, this will probably make more sense if you first read the Overview post and the Front Sloper post, both of which explain the terms we'll be using, the colors of lines and dots and the purpose of the hideous pink arrows. You will also find a Measuring Table worksheet in the Overview post that you can print out and fill out as you take measurements. To locate it, have the child tip his/her head forward so his/chin touches his/her chest. Feel on the back of the neck for the most prominent bone (first thoracic vertebra? Last cervical vertebra? I can never remember) at the top of the spinal column. In a garment, this position will be the bottom of a snugly-fitting shirt collar (or a mandarin collar). Mark it with a sticker or a marker. Let's get started! Remember now that all the measurements will be taken on/along the back of the child. 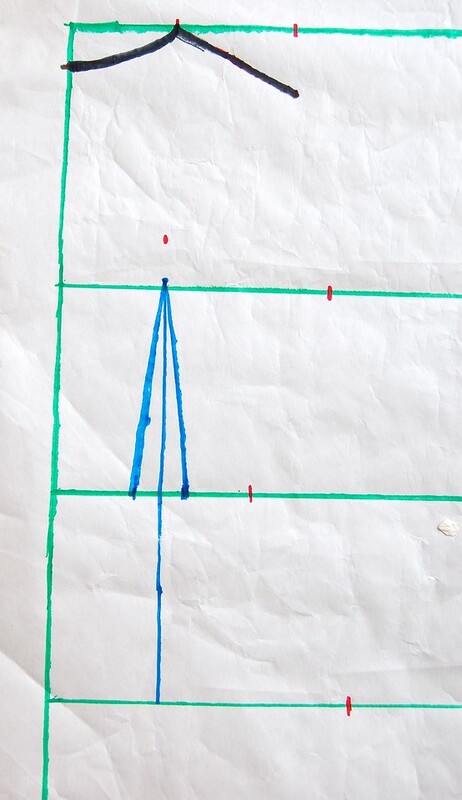 Draw the vertical Center Back line along the left side of the paper. 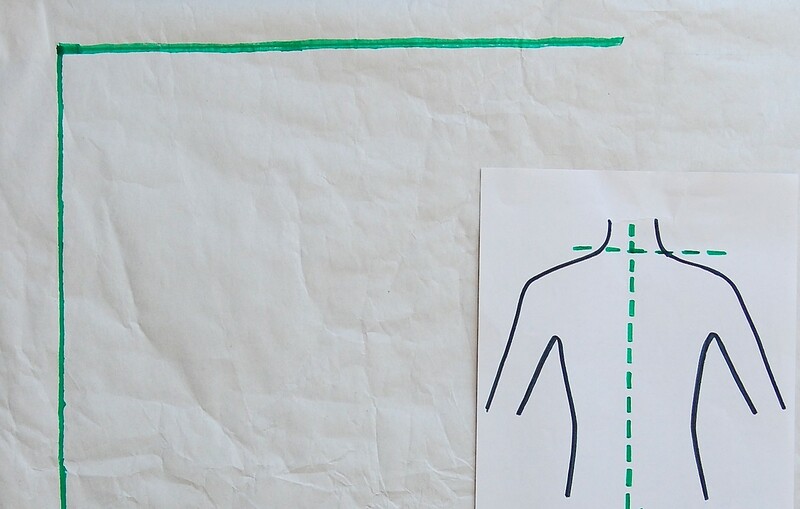 Draw the horizontal Shoulder Line along the top of the paper. Measure the vertical distance (#19) between the Side/Base of Neck point to the Waist. It may not be the same as the corresponding measurement in the front (#1). 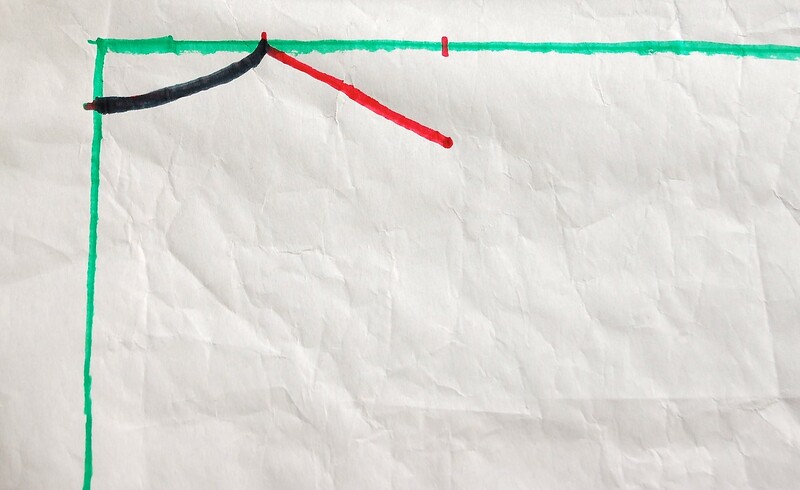 Draw a horizontal line this distance below the Shoulder Line. This is the Waist Line. Mine was 10.5". Measure the vertical distance (#20) between the Waist and the Back of Neck point. This is measured along the Center Back line of the body. 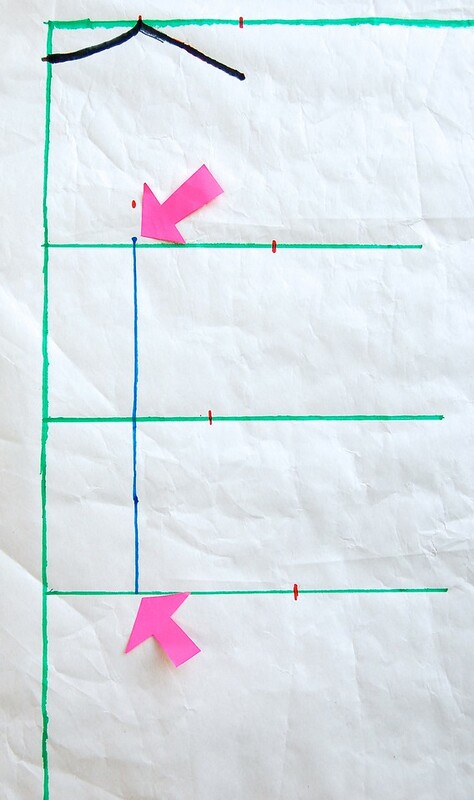 On the Center Back Line of your draft, mark a point this distance upwards from the Waist (pink arrow). Mine was 9.5". 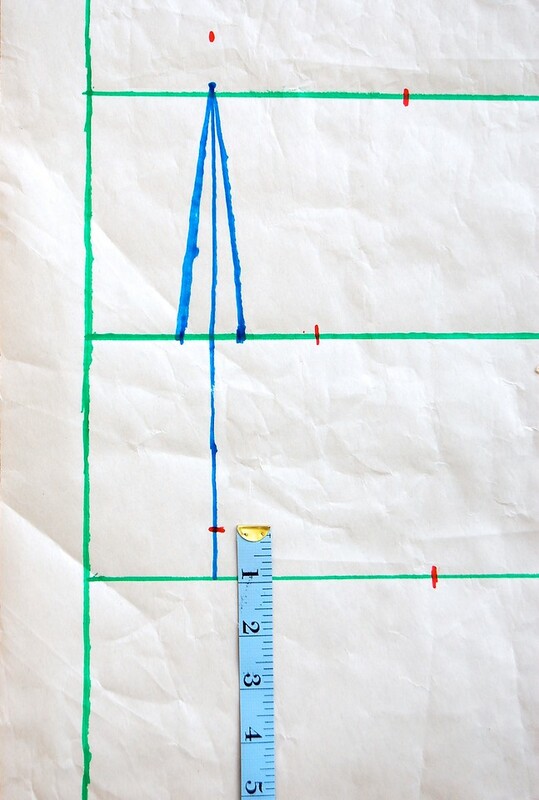 Measure the horizontal distance (#21) between the two Shoulder Points. This measurement spans both halves of the body, so we will divide the measurement by two to get the half value. Plot this half-distance from the Center Back Line (see pink arrow direction) and along the Shoulder Line, and mark the point. My Shoulder Width was 10" and the half value was 5". 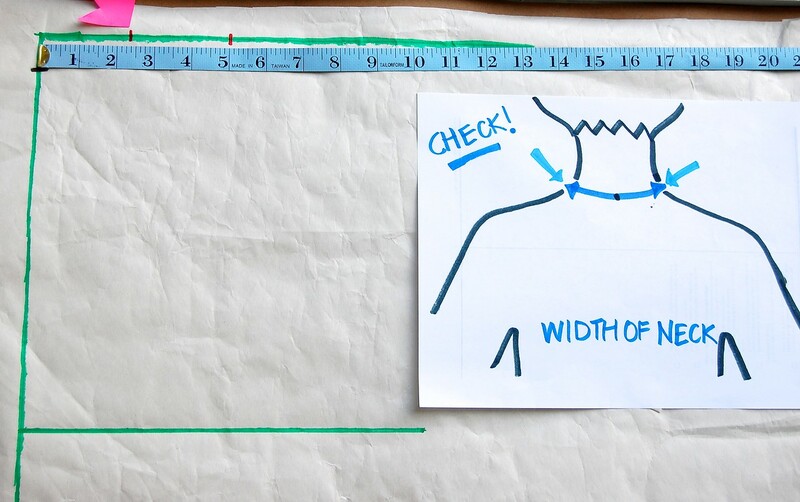 Q: Um, you know, some drafting resources recommend that you measure this distance sort of arched across the back of the neck, instead of purely horizontally across like you did. Who's right? A: Like this, you mean? The way my mother does? Also the way I measure my husband's shoulders to decide whether or not a store-bought shirt will fit him? Both work. It depends on what you'll do with the measurement. The real old tailors and other old-school types often use the arched-across-the-back-of-neck method. I learnt it that way also. Mum says it gives a better fit. She's right, but only because of how she uses that measurement in her draft. First, I must mention that the back of the shoulders is quite different from the front. There are muscles and bones in the back shoulder area that make that whole region more curved than the flatter front shoulders. If you have the chance to enjoy a bird's eye view of a person's head and shoulders, you'll appreciate this observation even more. For that reason, sometimes the back shoulder width is greater than the front, and even more so if that person has a rounded back or hunched shoulders or a similar anatomical gift. In such cases, we might even add a shoulder dart on each side of the shoulder seam to help shape the fabric around the roundedness. 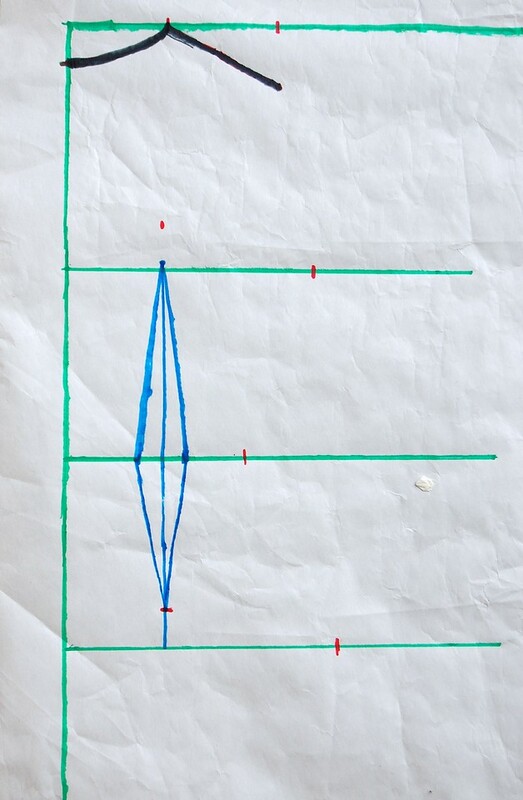 And to plot that dart, we measure the horizontal straight-across shoulder width (#21) as well as the arched-over-the-back-of-neck shoulder width that my mother uses and use the difference in those values to make the dart. But I imagine that we would hardly need that for the vast majority of children's slopers. Second, I will say that I use both measurements - the arched one usually as a check. We will use the straight-across measurement here because it is easier to visualize and more straightforward. And it is the same method as we used for the front. 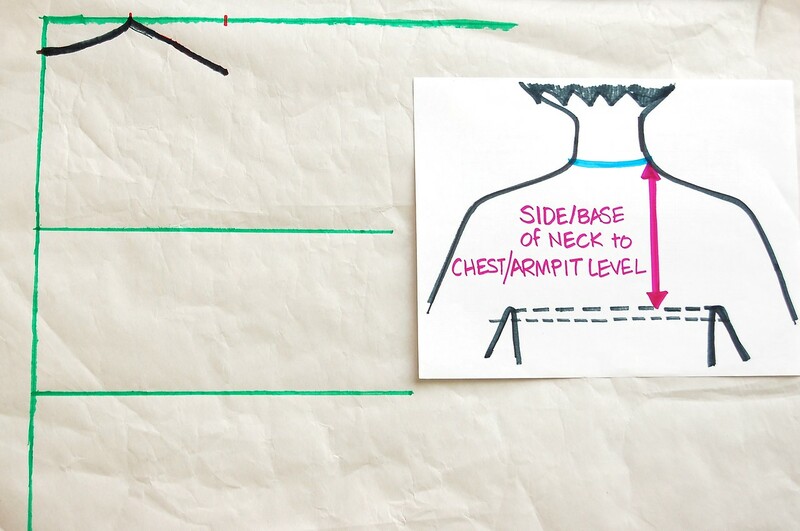 Measure the horizontal distance (#22) between the Side/Base of Neck and the Shoulder Point. 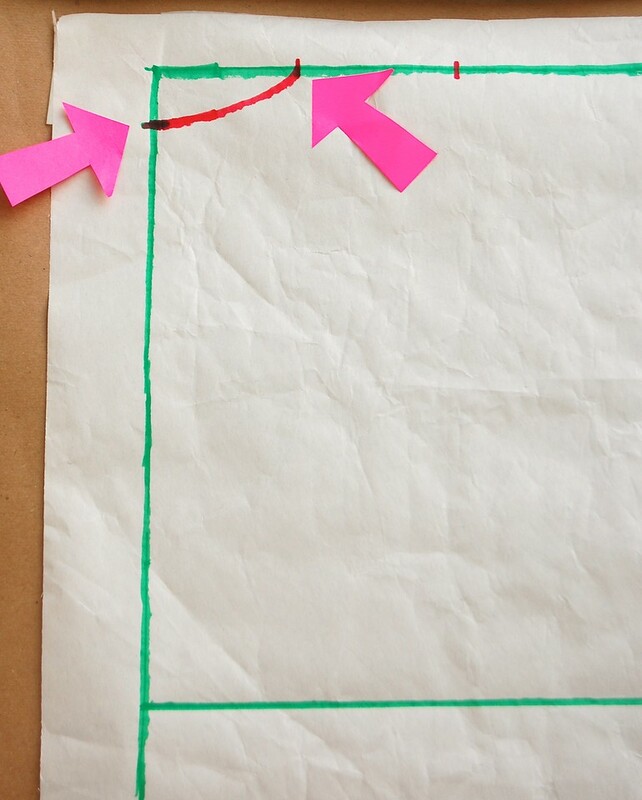 On the Shoulder Line of your draft, plot this distance backwards/leftwards from the Shoulder Point you plotted in Step 4, as shown by the direction of the pink arrow. Mark this point - it is the position of the Side/Base of Neck on your draft. Mine was 2 5/8". Here we will pause to do a check. 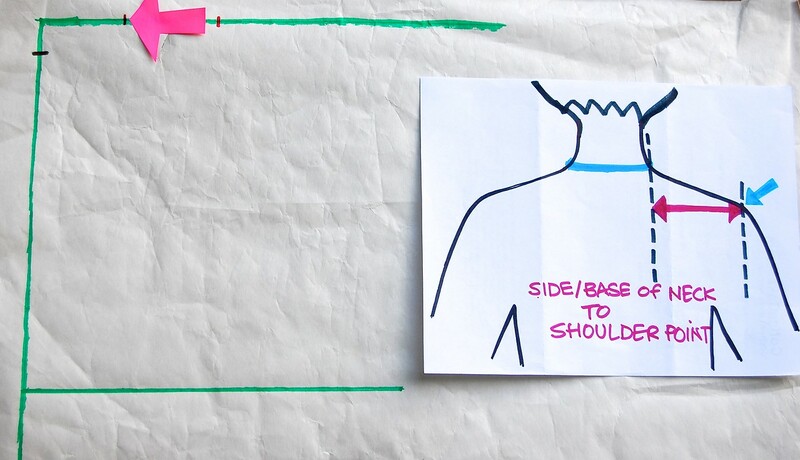 Measure around the back of the neck between the two Side/Base of Neck points as shown in the sketch (#23). Unlike the front Width of Neck (#5) measurement, this is not a straight-across one - it curves around the neck and passes through the Back of Neck point. As a result, it is a (slightly) greater value than the front Width of Neck. Divide this by two (because it spans both halves of the body) and check this half-value against your draft as shown. My width of neck (back) was 4 3/4" and the half value was 2 3/8". 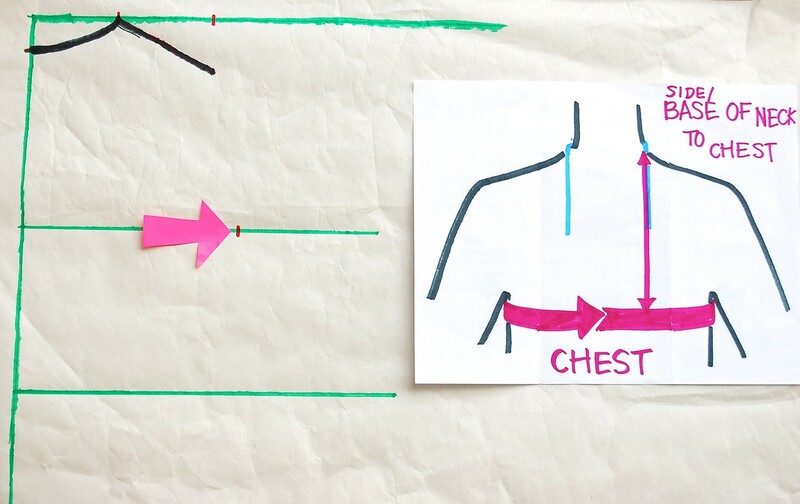 Now we will draw the Back Neckline between the Base of Neck point and the Back of Neck point, as shown by the two pink arrows. 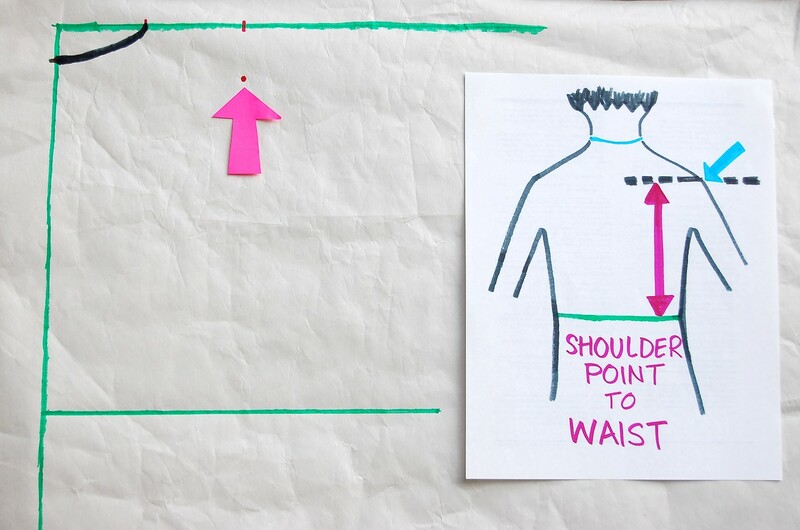 Measure the vertical distance (#24) between the Waist and the Shoulder Point. 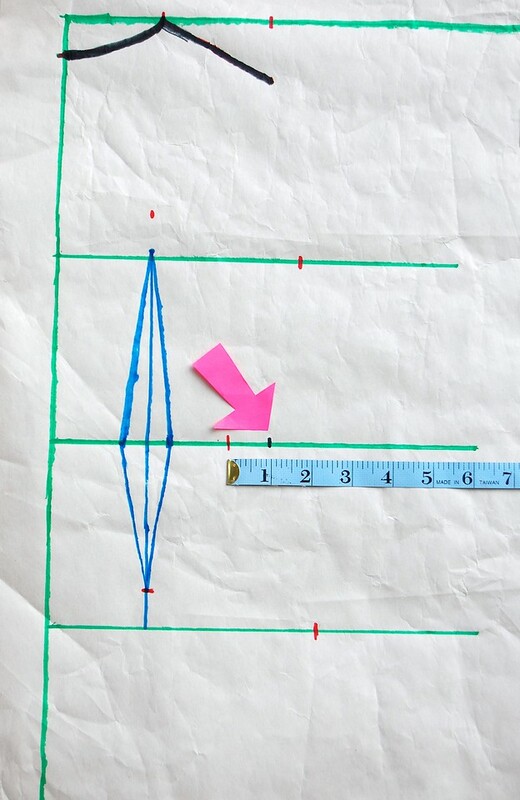 On your draft, plot this distance upwards from the Waist Line, and mark the end point so that it is directly under the mark you plotted in Step 4 (pink arrow). This new mark is the Shoulder Point. Mine was 8 7/8". Here we will do another check, just like with the front sloper. 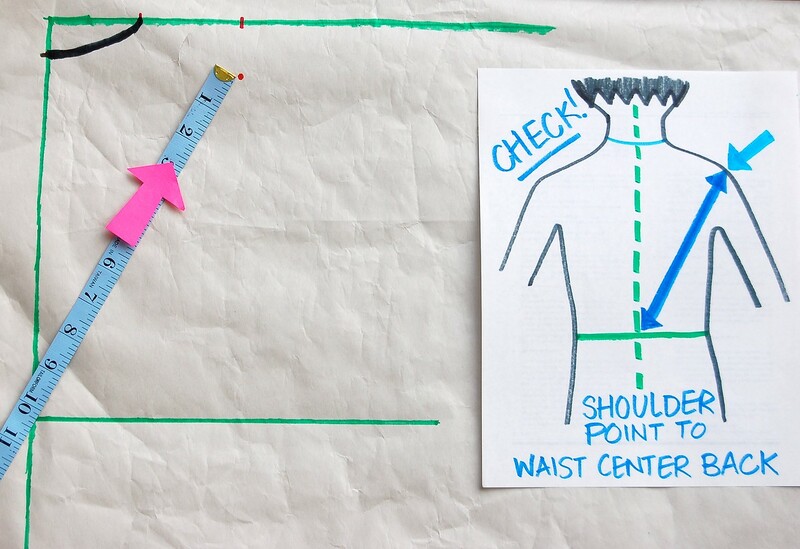 Measure the diagonal distance (#25) between the Shoulder Point you plotted in Step 8, and Waist Center Back point (the intersection point of the Waist Line and the Center Back Line). Check it against your draft - it should be the same (or very close). Mine was 10 1/8". 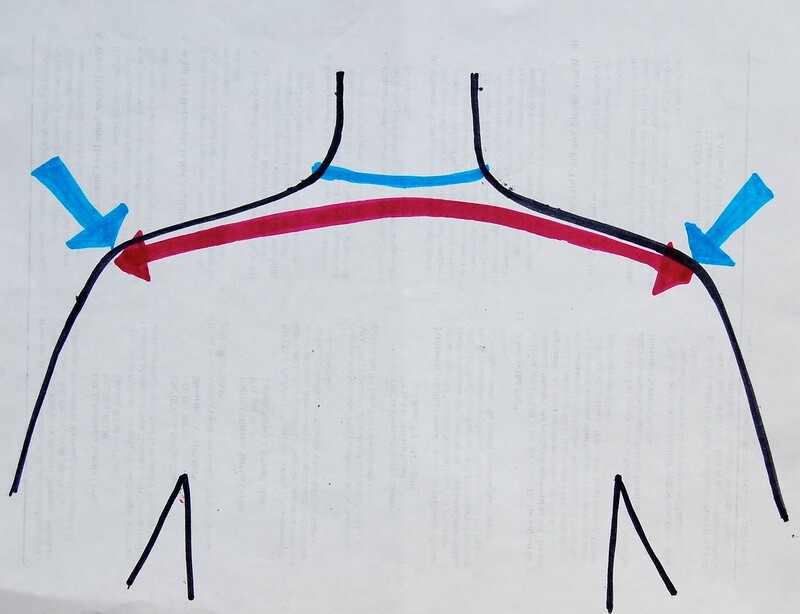 Draw the Shoulder Slope - a straight line between the Side/Base of Neck point and the Shoulder Point. We're now going to add in the Chest measurement. Measure the vertical distance (#27) between the Side/Base of Neck point and the Chest, the same way you did in Step 12 of the Front Sloper. 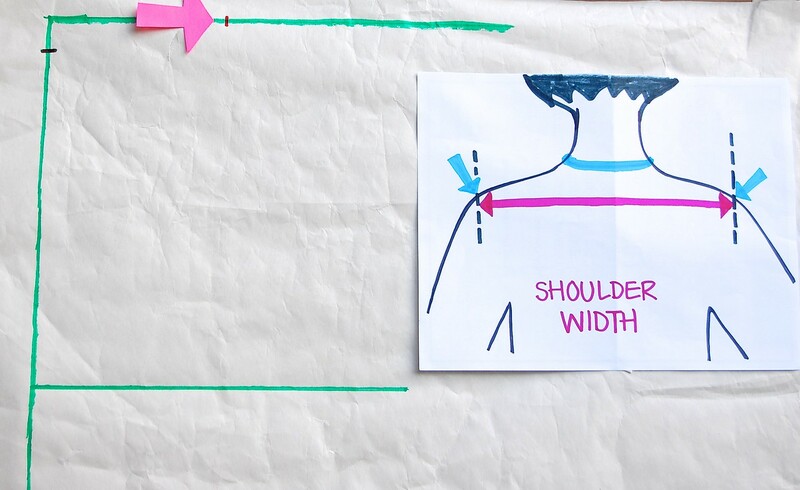 Add 1"of ease to that (just like with the Front Sloper) and draw a horizontal line on your draft that is this distance below the Shoulder Line. This is the Chest Line. 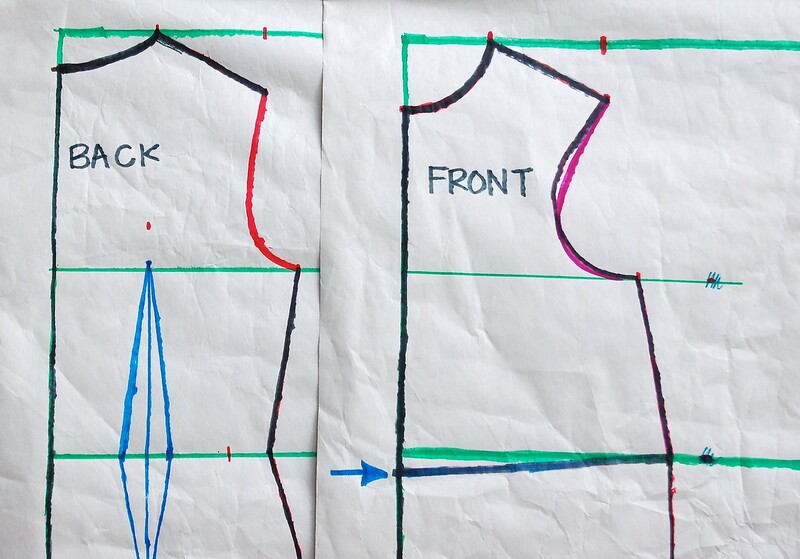 Use the same chest measurement (#26 = #9) that you used with the Front Sloper and plot the quarter measurement from the Center Back Line, along the Chest Line, marking the end point. We're now going to add in the Waist measurement. (i) Measure horizontally from one (imaginary) side seam to the other, around the back of the Waist, adding a little comfortable fitting ease. (ii) Subtract #12 from #13. Plot this distance from the Center Back Line, along the Waist Line and mark the end point. We're now going to add in the Hip measurement. 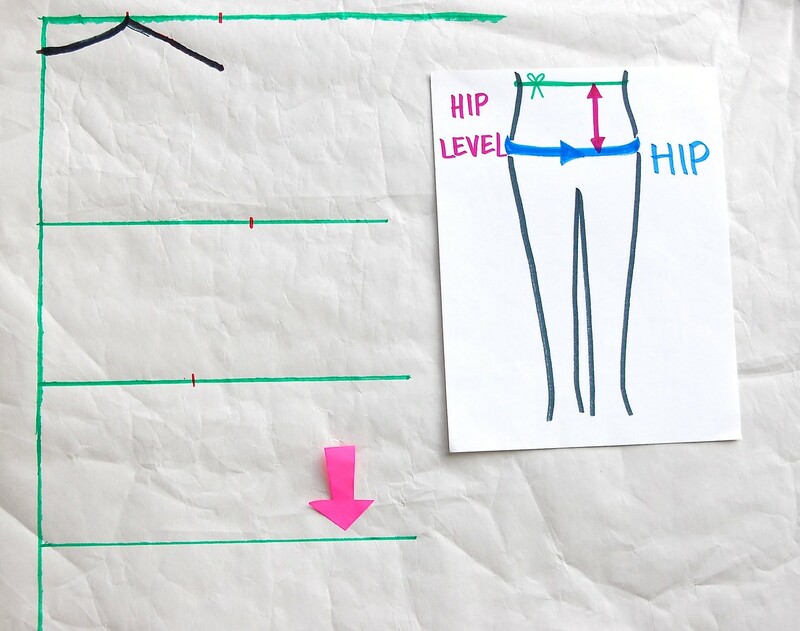 Obtain the vertical Hip Level measurement that is between the Waist and Hip. This is the same as #16. 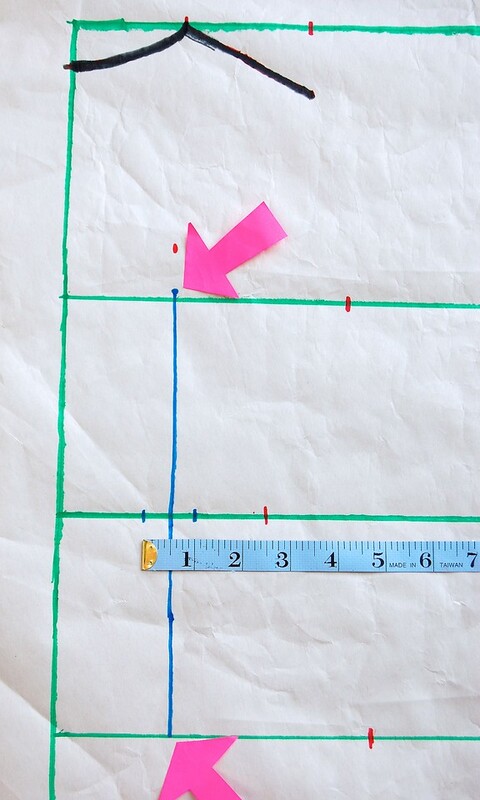 Draw a horizontal line this distance below the Waist Line on your draft. This is the Hip Line. (i) Measure horizontally from one (imaginary) side seam to the other, around the back of the Hip, adding a little comfortable fitting ease. (ii) Subtract #14 from #15. Plot this distance from the Center Back Line, along the Hip Line and mark the end point. Before we draw the side seam lines from armpit to hip, we need to add a back dart. Q: Why? You didn't add a dart in the front sloper! A: That's because it was for a child with no fullness (e.g. bust) in the front. If it were for a mature adult female there would be at least one dart in the front sloper. In the back sloper, however, children and women (and men, if they were willing to wear sheath dresses!) alike have a hollow in their backs that require a dart. First, we will locate the position of the upper point of the dart. For the back, this is strongly related to the shoulder blades. Often, people conveniently plot this along the Chest Line. That is a good rule of thumb, but I thought I'd explain the rationale a bit by starting with the shoulder blades. 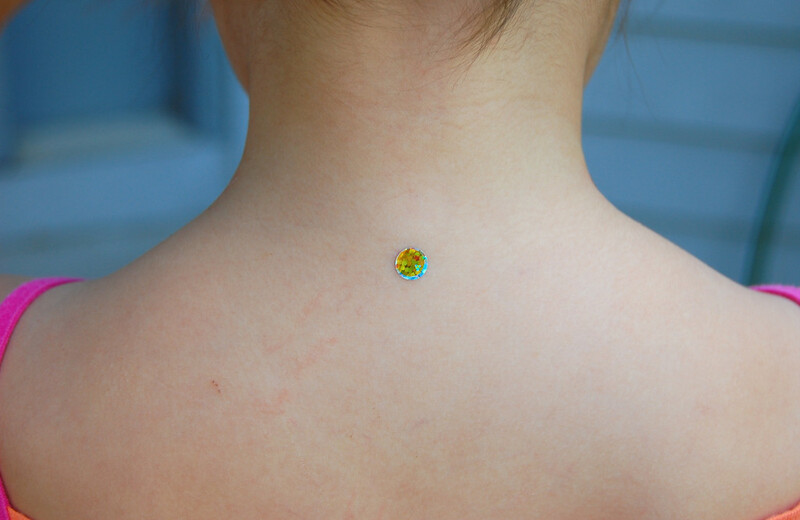 A: Because the shoulder blades are the sticky-out-est part of the back. This means that immediately below and around them are the hollowest part of the back. And a correctly positioned dart is one that reduces the fullness in the hollowest part of the body. So anyway, locate the shoulder blades of the child when he/she is standing at rest. Measure the distance between their edges (#30). This spans both halves of the body so again we will need the half-value. Mine was 4 1/4" and the half value was 2 1/8". Then measure the vertical distance (#31) between the Waist and this level of the shoulder blades. Mine was 5.5". 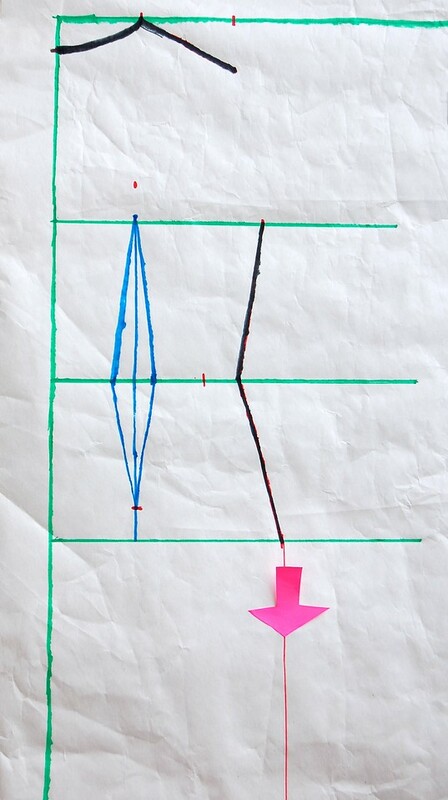 A vertical distance of #31 upwards from the Waist Line (second pink arrow). So my point was 2 1/8" from the Center Back Line and 5.5" upwards from the Waist Line. Now often when we plot dart points, we have them start a little way below, and end a little way above the actual start and end points. This gives a more gradual and smoother dart that wraps around the pointy bits of the body without themselves being pointy. So let's lower the upper dart point by 1" which is, again, a rule of thumb. Now our actual upper dart point is the one in blue. Which brings the point pretty darn close to the Chest Line, which we talked about in Step 16, which brings us full circle!. Except now we know why this dart is plotted with its upper point there. Draw a vertical line from this upper dart point all the way to the Hip Line. This is the center line of the dart. 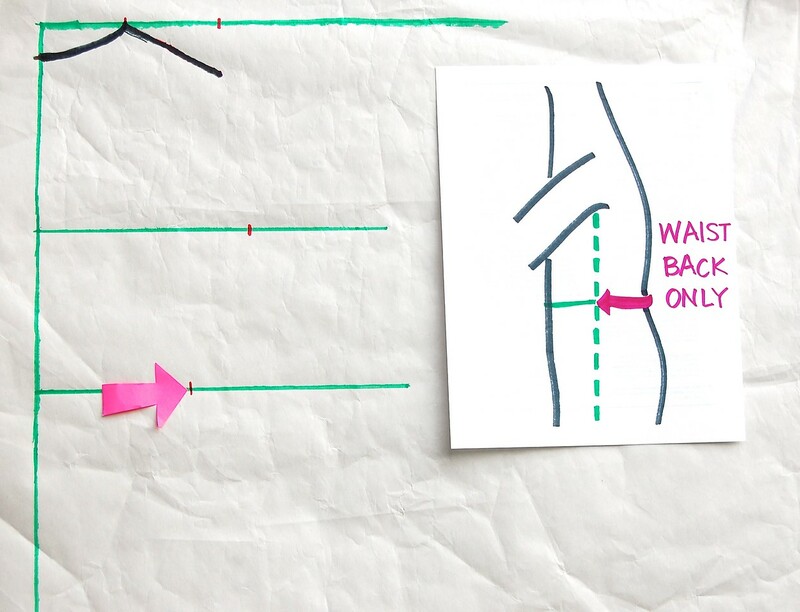 Q: Why stop at the Hip Line? A: The Hip is the biggest/fullest part of the lower body. Remember we said that darts reduce fullness at the hollowest parts of the body? The hollowest part of the back body lies between the shoulder blades and the buttocks/hip. The dart doesn't need to go below that. 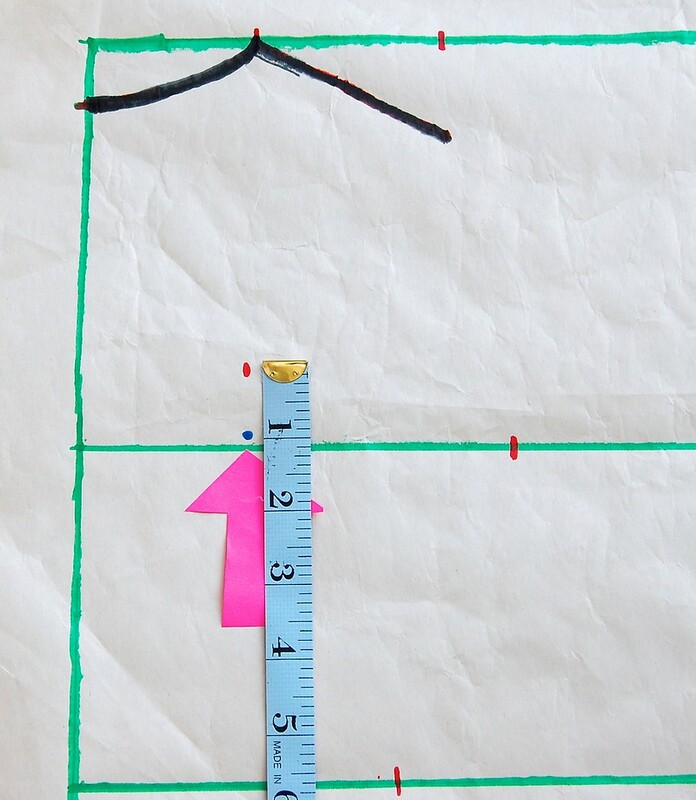 Measure along the Waist Line of your draft, half an inch to either side of that center dart line. These will be the side points of the dart. Q: Why 1/2"? Where did that 1/2" come from? A: Experience, and a convenient rule of thumb. Most people's backs are nicely darted with this size dart. But you will know for sure if it's the right size for you when you've made the muslin. Till then, this is a good starting point. Using the same rationale as in Step 17, we will raise the lower dart point by 1". Complete the lower half of the dart by joining the side dart points to this lower dart point. Now in making a dart, we are taking in some fullness at the Waist. 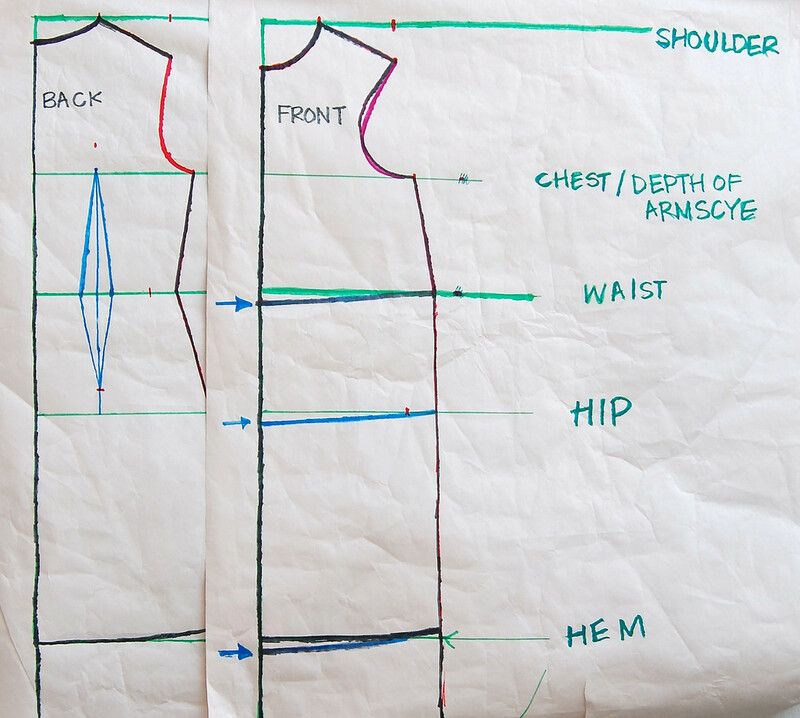 This means when we sew the dart in the garment, the Waist gets smaller by the width of the dart (1" in our case). This means the Waist is now too tight by 1". We need to add this dart width (i.e. the 1") to the side seam to bring the Waist back to its original pre-dart width. 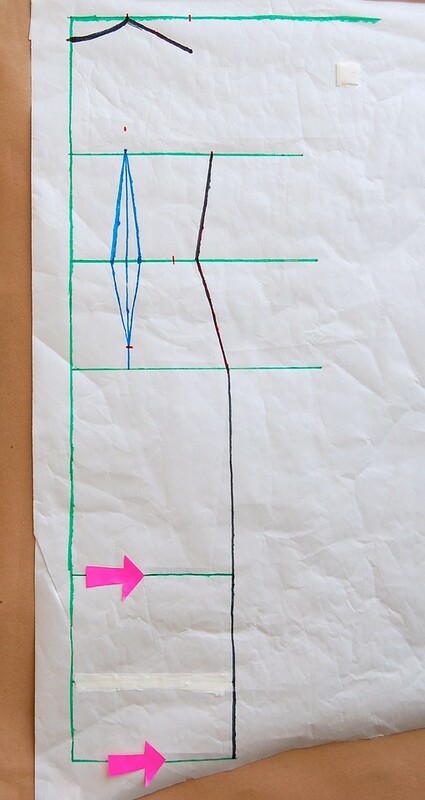 Mark a point 1" (width of our dart) to the right of the original (red) Waist point. This is the black point indicated by the pink arrow. Now let's draw in the side seams! One straight line from the Chest to the Waist and another straight line from the Waist to the Hip, going through all those pink-arrowed end points. 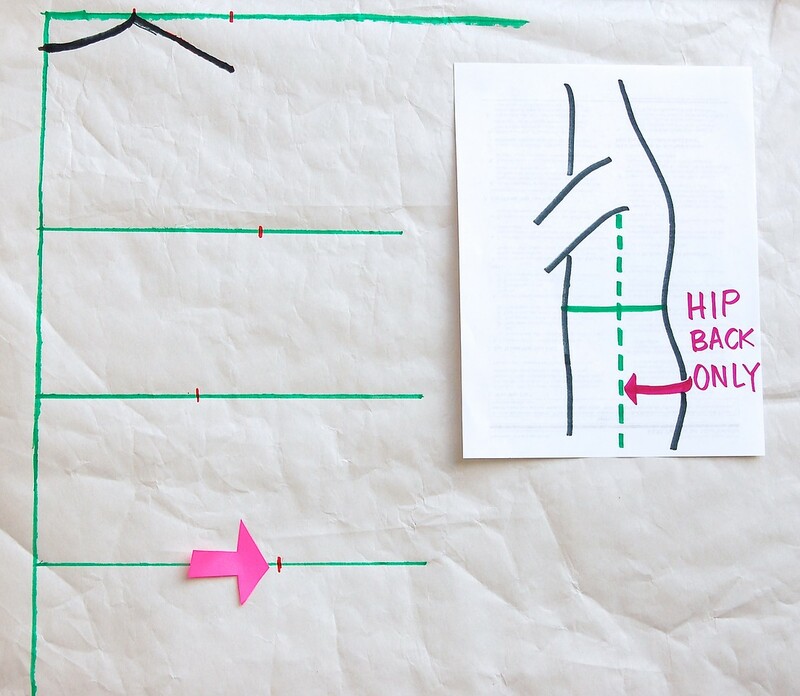 Drop a vertical line from the Hip (the biggest part of the lower back body) to form the rest of the side seam. 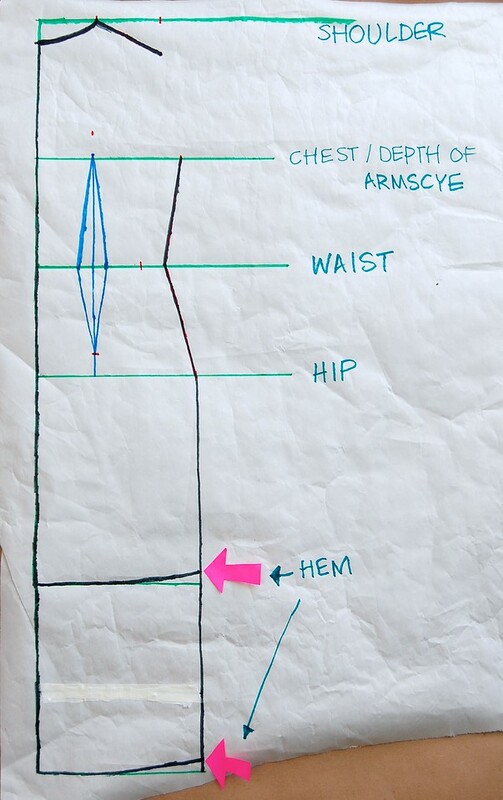 Obtain the position of the hemline(s). Use the Waist-to-Knee distance (#17) and/or the Waist-to-Ankle distance (#18) from the Front Sloper and draw in the horizontal Hem Lines. 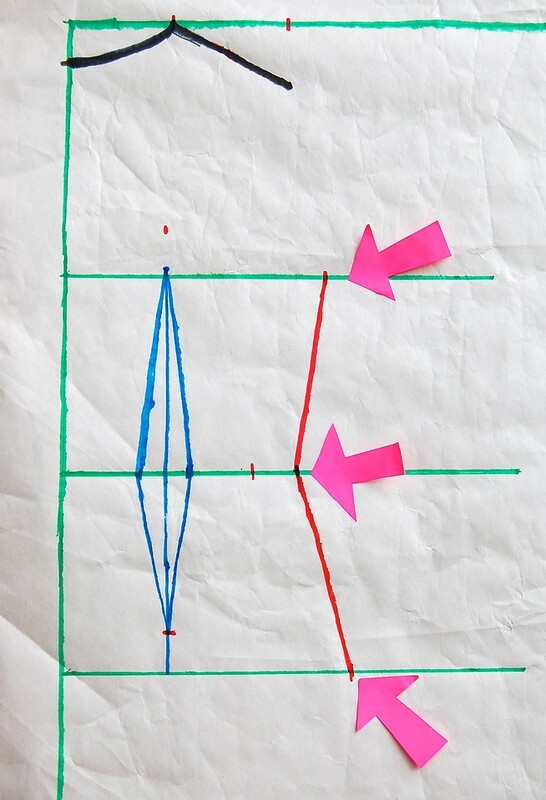 Draw in the back armscye (in bright red below), either with a free-hand sketch or using the round-down method (with the flexible curve) in Step 20 of the Front Sloper post. Here are the front and back slopers side by side so you can see the difference in shape of the two armscyes. The back is shallower (more vertical) than the front. And here are the front and back slopers juxtaposed: Notice that all the horizontal green lines match up (or are at least very close) i.e. the front Waist Line is at the same level as the back Waist Line etc. And now, cut out the slopers and do a final check for overall fit in the next post! I am SO lovin' this series!! Thank you for sharing your knowledge about measuring and drafting patterns! 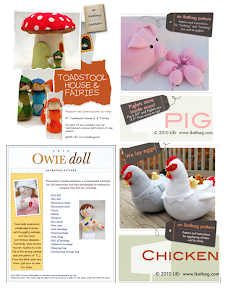 I'm reading it all very thoroughly and looking forward to making my kids fitted clothing now! Thought you might find it amusing that slopers are something completely different in my vocabulary. They are a type of climbing hold. In fact, my husband used to have a bumper sticker for a now defunct climbing website called "Fat Sloper Action". Incidentally, I only knew it was called a sloper when I came to the US. When I was doing this drafting thing back in Singapore we called it a block. So the lower portion was a skirt block, and the sleeve was a sleeve block and the upper part was a bodice block, and so on. Self-explanatory, that word "block". Is it a UK thing? I don't know. I know there is so much tradition in fine tailoring in the UK - Savile Row in London, for instance. I haven't seen an equivalent here. Maybe NYC? I always thought the word "sloper" was funny, because I couldn't figure out where the "slope" aspect of it was. But well, I live here now, and need to call it something that's recognizable by other folks here. The last cervical - has the longest spinous process. Thank you for our knowledge and your easily understood approach (with clear pictures). This has been so helpful! Aaargh! I have just drafted the front and back slopers and I have an inch of difference in the distance shoulder to waist - the back being longer than the front. In your tutorial for the back sloper, you say at point 2 that the back measurement may not be the same - but I don't know what to do with it now. 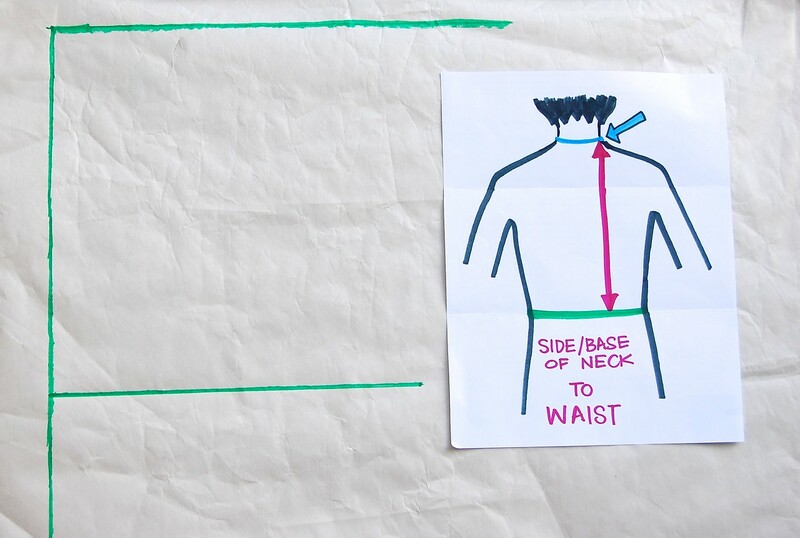 All other ratios - shoulder to chest and waist to hip are the same - but the waist and hip are now an inch out. THANK YOU THANK YOU THANK YOU for posting this series! You can only sew for so long using patterns made by others before you wonder about the proportions, geometry, and method to it all and want to design your own. I have been researching for weeks trying to find good resources to learn drafting! At first I didn't even know the terminology to google by but since I realized what a "sloper" was I have come across several tutorials and bought 2 books on the subject. Your postings contain the most straightforward and comprehensive summary I have seen yet! I feel I am finally starting to grasp the basics of patternmaking! THANKS SO MUCH!! THANK YOU THANK YOU THANK YOU for posting this series! You can only sew for so long using patterns made by others before you wonder about the proportions, geometry, and method to it all and want to design your own. I have been researching for weeks trying to find good resources to learn drafting! At first I didn't even know the terminology to google by but since I realized what a "sloper" was I have come across several tutorials and bought 2 books on the subject. Your postings contain the most straightforward and comprehensive summary I have seen yet! I feel I am finally starting to grasp the basics of patternmaking! THANKS SO MUCH!! Do you happen to know any good teaching tools for grading to different sizes once you create a well proportioned design that works on one subjects body? Oh-my email is lkellywoods@hotmail.com. I know you must be busy-but if you know any good pattern grading resources you can share, I would love to hear about them if you get a chance. Thanks so much! Okay, am I completely bonkers? My daughter's chest, waist, and hip measurements are near identical (she's 4 and very cylindrical! ), so when I draft the back sloper, is the waist line really supposed to jut out beyond the chest and hips? That's just the dart making it do that, right? Oh dear...where's my Nutella? i succesfully made a slopermfor my little one! i tried making one for myself with other tutorials but ive had no luck. would it be too much to asl for you to make a tutorial on the extra measurements to include for the front sloper for women?! .this is the best and most comprehensive tutorial i have come across so far. Thanks a bunch for this. I have drafted the front and back slopers. But what I found the hardest was getting the measurements right. My six year old has been really great as I have measured her so many times before settling (finally) with one set of measurements. It gets easier and more accurate with experience I guess. the best thing about your tutorial therefore has been that you have included your own mesurement as well. This was a brilliant guide for me to check against. As most measurements were about 1/2inch more for my daughter.with other tutorial s I always got dtuck at drawing the armscye. But not any more. I'm so pleased and satisfied. I have a question if you find the time to reply. Should the centre of the dart always fall on the waist libe? Firdt time it didn't. I think I measured the waist to shoulder blade wrong.my email is nw192001@yahoo.com. I came across your awesome series on drafting a wee while ago, but have only just got up the courage to have a go at making a sloper myself. I have a similar problem to Lin2Too - on my draft, the back sloper's neck/shoulder to waist measurements are longer than the front ones, and chest-waist measurements aren't the same. When I try to put the front and back slopers together to check fit, the side seams don't match up so the armscyes are really skewed. Not sure how to fix this... do I just need to try and re-measure my fidgety, tickly 6 year old and hope I get better numbers next time?? First, be reassured that your dimensions/measurements don't have to be absolutely perfectly matching when you draft your first (or even subsequent slopers). Do the best you can and MAKE THE MUSLIN. All things will work themselves out upon trying the muslin on the model, because you'd then be able to determine which of those "rogue" measurements was really rogue. It could be that both the front and back neck-to-waist numbers were totally off. Or it could be that they were both right, but not in the way you thought. You'll end up learning from the errors and unmatching bits as much as from the theory and following the instructions. Muslins are wonderful teaching tools, because you will be able to see exactly how the measurements (correct or not) you took look as actual body lines. Eventually, you'll even be able to auto-correct the inconsistent bits in your drafting before even making the muslins. It's called "experience" and there is no short cut; no one is an instinctively/natural better drafter than any one else at their first try. 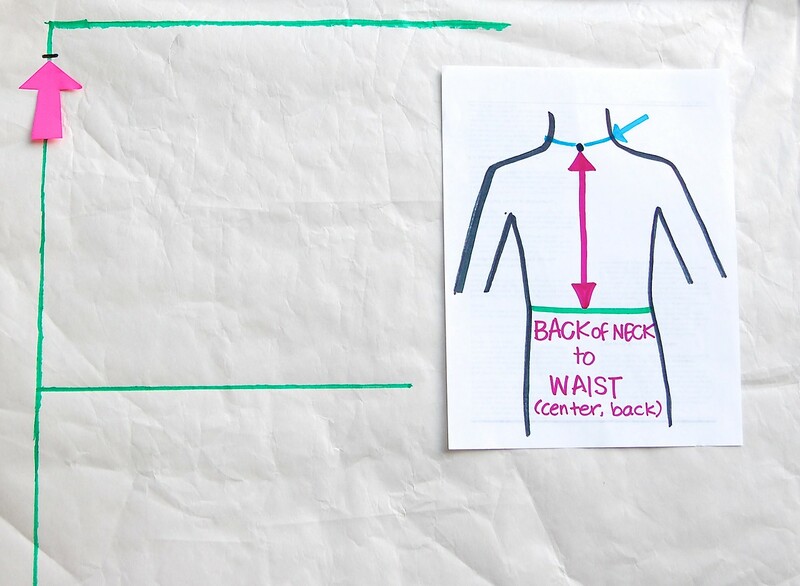 Second: The back neck-to-waist measurements ARE often longer than the front, because of the muscles on the back shoulder, especially if the person hunches a little (not uncommon in children and even many women, unless they are models/ballerinas/princesses). I'd say just go with it. If the back waist position that you used was really far off the mark, you'd be able to tell in the muslin. Third: The side seams must match up. Even if you have to force them. Don't worry at this point if it implies you messed up in your measuring. It's okay. You're learning. 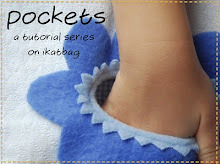 Therefore, take whichever side seam (front or back) is shorter and lengthen it so it matches the other. This will automatically make your armhole smaller, which is not bad. If it ends up being too tight in the muslin, then the fix is easy: just cut off a bit at the bottom, thereby shortening BOTH front and back side seams by the same amount simultaneously. At this point you can compare the final side seam length with the measurements you took and deduce what went wrong. 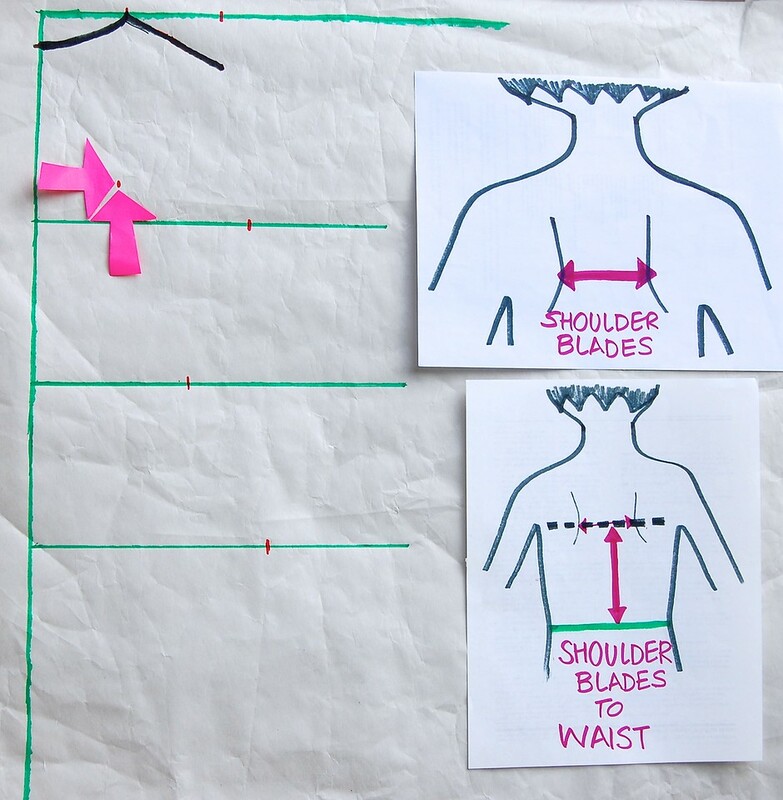 Could I use one of your pictures in a policy at work to show people how to measure across the shoulders? Anonymous: yes to a single photo, with credit to www.ikatbag.com, and excluding any of my children's faces. How do I do pants for children?